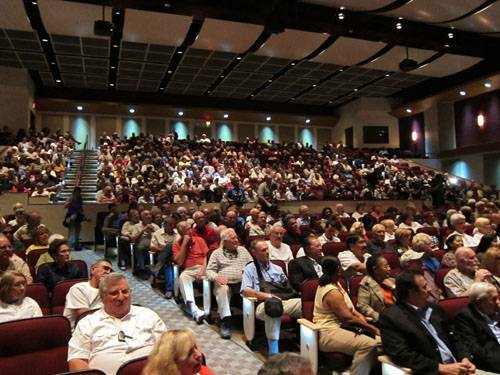 TexasGOPVote attended a Harry Reid, Sharron Angle Senate candidate forum in Las Vegas on September 23rd. The forum was moderated by Vegas PBS host, Mitch Fox. Each candidate had 30 minutes to answer the same 6 questions. Since Congress is in session, Democrat incumbent Harry Reid pre-taped his answers, while Republican candidate Sharron Angle appeared live. 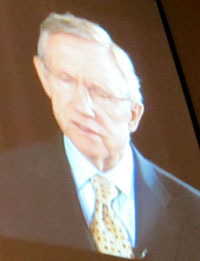 The interview with Harry Reid was played on two jumboscreens for the first 30 minutes. Mitch Fox interviewed Sharron Angle live for the second thirty minutes. Each candidate was interviewed without their opposing candidate present. Before Mitch Fox was able to ask the first question, Harry Reid cut him off and started talking about the Lutheran high school the forum is being held in. He said that he personally knew the man that gave money to build the school. He went into a long tangent discussing how great Mormons, Lutherans, and Methodists are. It appeared as if he was attempting to stall the moderator from asking him questions about the economy and pandering to the Christian viewers. Mitch Fox (who looked a little annoyed about Reid's off topic discussion) got Harry Reid back on track as asked him the first question - Nevada has the highest unemployment rate in the nation (14.4%), how do we fix this? Harry Reid said that the only thing to do is create jobs. History lesson - Las Vegas used to be the place for people to come to get a job. When Wall Street crashed, so did Las Vegas. Reid mentioned that he has put through tax incentives that have helped. He also explained that he put debt cancellation into the Stimulus Package, which allowed places like Harrah's and some other places on the Las Vegas strip to save jobs. Sharron Angle started off by saying that Nevada's true unemployment rate is 21% and in order to get out of this, Nevada will need a fix not a band-aid. "There is a fog of regulation and a fog of taxation in Washington! There is way too much governmental regulation." She explained, for example, environmental regulations don't allow copper smelting in the US so the job is outsourced to China - less regulation could help with jobs. Mitch Fox's next question was how, as U.S. Senator, would each candidate better Nevada's economy. Reid explained that he wanted to add more power lines, saying that this will bring energy independence to Nevada. He also passed the Travel Promotion Act, saying "It was hard to do, I had to push hard on this." He explained that since 9/11, fewer and fewer people are coming to the United States for vacation. The Travel Promotion Act promotes tourists to come vacation in the U.S. He explained that every tourist coming to the United States has a 14% chance on vacationing in Nevada. He also explained that the MGM hotels are doing well, Luxor Hotel management told Reid recently the hotel was at 98% capacity. He also mentioned that Steve Wynn is building and helping the economy. Sharron Angle explained that the corporate tax rate should be reduced to 20%, which would help bring more businesses into the state. "Nevada is a resource-rich state, we could build coal-fire plants. We could also see more lithium mined here." She explained that additional industries, like nuclear energy, should be explored. The next question had to do with health care. Fox asked, "In 3-5 years, what will we be saying about health care reform and its impact?" Reid said, "More like 3 years, but in 3 years, everyone will have health insurance. If small businesses want to get health insurance for their business, they can! ...Can we afford it? We can't afford not to do it! This health care bill will actually lower the debt!" Sharron Angle responded, "We have the finest health care system in the world, there is nothing wrong with it. The problem comes with the cost. Obamacare (union workers in audience yell 'say health care!') does not fix that." She explained that the first thing she would do as Senator of Nevada would be call for the repeal of the health care reform bill. "There are solutions for health care, but solutions don't lie in the government, they lie in the free market." She said that health care plans should be able to cross state lines. She also said she would call for tort reform. "Obamacare has taken a half trillion out of the medicare system which is hurting our seniors. We need to make sure that our medicare is whole for our seniors, and that means they can have choices like Medicare Advantage." Mitch Fox continued on to ask about Education. Nevada has one of the worst public education systems in the United States. State legislatures are responsible for education, but is there a role the federal government can take to better the education system? Reid restated that Nevada is at the very bottom of education and that the state legislature and governor need to do something about that. He explained that government should put money into school renovation so schools can focus on education and not the physical building. Angle said, "I got my degree in education, and, in fact, I got into politics because my son failed kindergarten." (The Harry Reid union guys jeeringly laughed.) She explained that her son was demoralized, and so she took it upon herself to homeschool him. She explained that after she made this decision, the federal government tried to discourage her from homeschooling her own child. "This is the federal government getting in between me and my child." She continued on to explain that the federal government just uses a one size fits all approach to government, which doesn't work - made clear by the no child left behind program. The state and local communities know what's good, not the federal government. "As your Senator, I will help you with your Tenth Amendment rights to reclaim education." Mitch Fox's next question was about whether the Bush tax cuts should be extended. Reid said that it's clear that people making under 200,000 should have extended tax cuts indefinitely. However, he did not agree to extend tax cuts to the rich. He said the additional tax money from the rich should be put into infrastructure to create jobs. He then said the real problem is that the Republicans say that if you don't give the tax cuts to the rich, then we won't give them to the poor. Sharron Angle explained that the impact of the Bush tax cuts expiring is almost unmeasurable. "I have a record of voting against taxes 100 times. My opponent has a record of voting for tax increases 300 times...As Senator, I will be putting in measures that will reduce taxes." To conclude each candidate's 30 minute question and answer session, Mitch Fox asked for a concluding statement. "Why should constituents of Nevada vote for you to be their U.S. Senator?" Harry Reid went on to tell a story about how he used to coach little league baseball. He explained that a rule he learned was that you don't take someone out of the game unless you have someone better. He went on to say that he is the highest ranking officer from Nevada. "I didn't go out and seek this position, it just happened." He stated that his opponent wants to do away with the EPA... "I don't think so with global warming. It's been the hottest in Nevada it's ever been! If all the voters are the coaches, why would you take the player out of the game?" 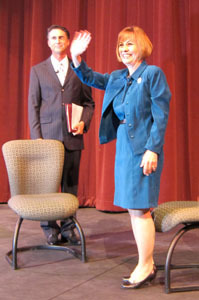 Sharron Angle said that the people of Nevada can trust her. "In my legislative record, I have a record of voting for tax decreases. Reid has voted for tax increases and obamacare." The candidate forum was a great opportunity for Nevadans to compare the two candidates' contrasting points of views about issues that will directly affect them. However, not everything went as smoothly as it could have. Throughout Harry Reid's question and answer session, he appeared to be stalling to take up time, and instead of really answering the questions about what he would do in the future as senator, he talked more about what he had done. However, with the nation's highest unemployment rate, Nevada cannot stand for Harry Reid to maintain the status quo. He should have been discussing what he would do differently in the future to better Nevada's economy, but he did not. He also kept reminding people that he was the highest ranking office holder Nevada has ever had - this came off as a desperate attempt to hold onto his job just because of his power not because he has any ideas to help Nevada's economy - not a smart thing to say with the current anti-incumbent sentiment sweeping across the nation! Sharron Angle appeared sincere in her answers and held up well against the taunting Harry Reid observers. The mainstream media has neglected to discuss the answers each candidate gave on the issues, and has instead, focused on a fight that broke out right after the forum ended. 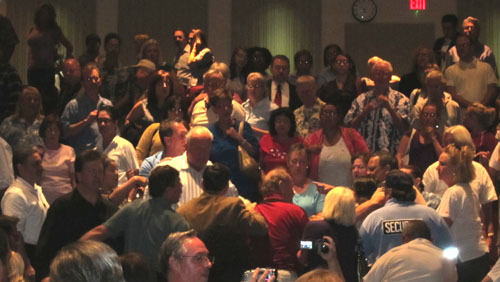 Yes, a fight makes for a good read, but it's too bad that the media let a 20 second brawl take over the Harry Reid, Sharron Angle candidate forum story. Maybe it was because the liberal media had nothing good to say about Reid's answers, and they were forced to divert the attention away from the candidates' answers? Nevertheless, how each candidate will work to fix Nevada and the rest of America's economic problems is the only thing that will matter in the end. There are other alternatives! Why the media is only shoving two candidates down our throats is a guess? Both parties have betrayed our country and our financial securities. Currently you have congress representatives of each party talking about our failing country. They, the Republicrats, are truthfully responsible and yet, mysteriously, we are calling this good and acceptable? Stand up, think and place your vote with a true voice of the people by selecting Jesse Holland for United States Senate representing Nevada and the citizens. The media has chosen your candidates for the elections, but we, the people, have suddenly accepted their choices? We talk about taking back our rights and country, but we fail to do much about it? Do the right thing and elect Jesse Holland who is easily found online! Even the polls are purchasable. If you leave out the voice of the people, you end up with a bought poll. Maybe your parents were right by saying don’t believe everything you read.